An amazing night of music and song from one of the very best voices around BC today. Opera Meets Broadway II presents the superbly talented Brandon Thornhill accompanied by versatile and gifted pianist Glen Stevenson Saturday, June 11, 2016 at Medici’s in Oliver. This magnificent performing artist is back. Brandon Thornhill, a Masters in Music from UBC,has performed numerous Concerts and Operas all over the musical landscape with the UBC Opera Ensemble, the Vancouver Symphony Orchestra, the Okanagon Symphony, as well as National and International engagements. His vocal talents are incredible. His stage presence magnetic. He is bringing us an evening of Sinatra, Gershwin, Puccini, Andrew Lloyd Webber and more. If you missed him 2 years ago then you missed a talent rarely available in an intimate setting like Medici’s. Don’t miss him this time. 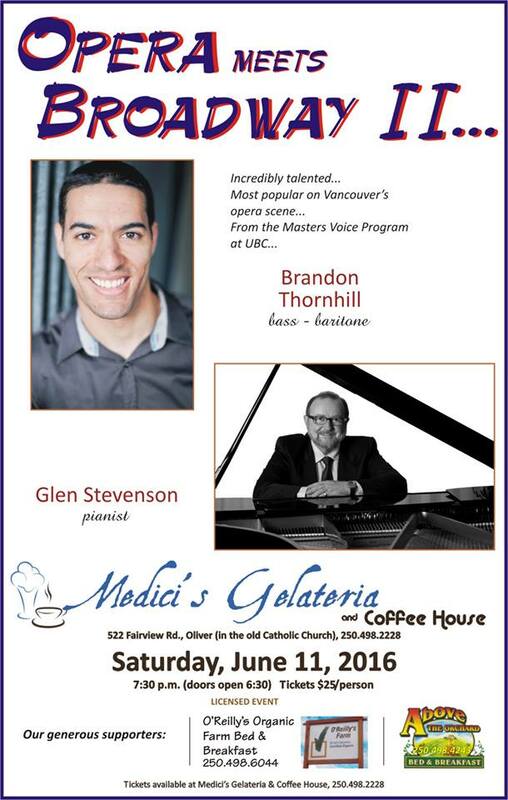 Glen Stevenson, a gifted pianist and long time friend of Medici’s will again be on hand to accompany one of the finest vocalists form the Vancouver music scene. Glen has toured extensively with numerous shows and performers. He is a highly polished performer with a long list of credits to his name and has literally played ,all around the world. Fortunately for us he makes neighbouring Vancouver his home and Oliver a favourite place to visit.